Summer is here and families are ready to hit the road to their summer vacation destination. 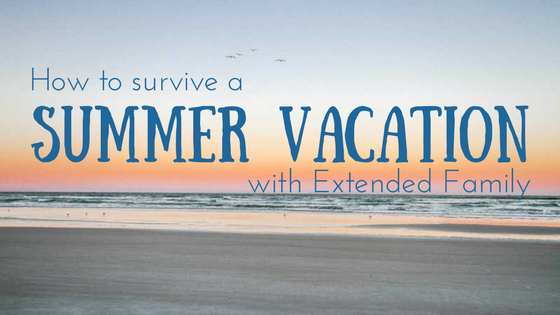 Now more than ever, many families are spending their summer vacations with extended family. How much of an extended family you might ask? Everything from bringing grandparents to siblings getting back in touch as a group gathering. If you are traveling with extended family this summer, take note of these family vacation survival tips. Of course I would suggest Crescent Beach. The there is so much to do at the beach for all ages. You have the ocean to cool off in, the sand to build things in and the pure serenity that the beach gives everyone. The kids have plenty to do at the beach and tend to get worn out for an easy summer bedtime routine. Adults of all ages enjoy the beach simply because of its beauty, as well as the wonder of wildlife that is present. I am a St. Augustine native and I still get excited when I see the dolphins pass by in the early evening. You will want to choose something that is accommodating to your needs. When you are traveling with a large family, you will want to make mealtime easy and not complicated. What do I mean by complicated? Think of how long the wait is when you are trying to seat a party of more than four at any given restaurant? The wait is long unless you go really early or really late, which is not an option when kiddos are involved. This is why many families, extended or not, tend to vacation in a condo. When you stay in a family-friendly condo, you will have either a full-service kitchen or kitchenette that can allow for quick snacks and easy to make meals. Not only does this fit into your schedule, but it also saves you money. You will also want to consider a place that it is easy on the “family logistics.” What do I mean by that? We love our family and we enjoy their company but you also need your space. Condos are a great choice for “family logistics” in the essence that you can choose units near each other, as well as not be on top of each other when in the unit, unlike hotels, you often don’t get to choose which room and the only privacy you can get is the bathroom. You love your family and truly enjoy their company, but have you ever heard of that saying, “Too much of a good thing?” This is the same for family. To ensure everyone stays on speaking terms during and after the summer vacation, take a few breaks during your stay together. This works out great when family members want to see different things. While some family members may want to see the manatees in the St. Johns River, others may want to go shopping in the historic district of St. Augustine. Set up groups for these separate adventures. In case you don’t want to see separate sightings, perhaps you can choose at least one meal a day that you have on your own. A lot of our guests that travel with extended families tend to have breakfast alone. Nothing will beat the view from your condo for breakfast. Lunch is usually spent on the beach together with fruit and sandwiches and dinner is a fun cookout in the bbq area. There is something about bringing your favorite dishes together to keep the harmony going among family members. Many of our large group guests like to make a dish in their condo’s kitchen and then everyone meets around the grill for the main course. When they each bring something potluck style it not only brings them together but it saves on the cost of everyone going out to eat together. These are just a few of my survival tips that I have learned over the years while listening to my guests, after all, they know best.